The Access Board's Rail Vehicles Access Advisory Committee will hold its first meeting October 15 and 16 in Washington, D.C. The Board organized this committee in May to assist the Board in reviewing and updating its Americans with Disabilities Act (ADA) Accessibility Guidelines for Transportation Vehicles. The committee will develop recommendations on updates to sections of the guidelines covering transportation vehicles that operate on fixed guideway systems, including rapid, light, commuter, intercity, and high speed rail. discussion of issues for potential consideration by the committee. Committee meetings are open to the public, and interested persons can attend and communicate their views on issues of interest during designated public comment periods on each day of the meeting. Organizations or persons not on the committee may also have the opportunity to participate in any subcommittees formed by the committee. For further information, visit the Board's website or contact Paul Beatty at rvaac@access-board.gov, (202) 272-0012 (v), or(202) 272-0072 (TTY). Note: An assistive listening system, Communication Access Realtime Translation (CART), and sign language interpreters will be provided. For the comfort of all participants and to promote a fragrance-free environment, attendees are requested not to use perfume, cologne, or other fragrances. UnBard TV is an accessible community, culture and arts TV program where people with and without a disabilty will be able to view mixed art mediums. This will include art, drama, music, dance and multimedia activiites created through a variety of community collaborations. The weekly episodes will be broadcast on Foxtel's Aurora Channel and available on youTube. The program content will feature artists from around NSW Australia and also feature peak disability and arts organizations such as Accessible Arts, Beyond The Square, Regional Youth Support Services and specific community art projects from local councils. Episodes are 30 mins long and run over 4 - 6 weeks as a series. Each episode will consist of footage from rehearsals, interviews, behind the scenes, performances, documentaries and short movies. It will be a platform for people to share stories, showcase individual talents, celebrate community achievements and help to inspire others to realise their creative potential. Participation in the program will provide important skills for life and offer potential for supported employment. Visit the UnBard TV website. A webinar in the Board's free monthly series will take place October 3 from 2:30 - 4:00 (ET) and will cover accessible surfaces for playgrounds. In this session, Board staff and a representative from the National Center on Accessibility (NCA) will present results from a recently completed study on playground surfaces that assessed how well various types of surface systems, including engineered wood fiber, poured in place rubber, and rubber tiles, perform over time. NCA conducted this research with funding from the Board. August 27, 2013; Washington, D.C. - Today, NPR News reports on a growing movement, backed by a new federal mandate, to build "accessible" playgrounds meant to include children with disabilities - and releases a first-of-its-kind, community-edited guide to such playgrounds nationwide. Trang web cá cược trực tuyến"Playgrounds for Everyone" maps 1300+ accessible playgrounds - with features like smooth surfaces, swings with backs or safety harnesses, ramps to allow children to access play towers and slides, or sound-play features like drums or chimes. The app coincides with a report on the issue of accessible playgrounds, airing today on All Things Considered. Robert Benincasa of NPR's Investigations Unit reports that federal law now defines playground accessibility as a civil right under the Americans with Disabilities Act, requiring that structures built or altered after March 2012 to meet those standards. Kids in wheelchairs need smooth surfaces to navigate; some inclusive playgrounds offer Braille or textured materials for kids with sight impairments. But as Benincasa reports, such playground features are cost-prohibitive for many municipalities, leading parents and activists to seek support from local civic groups to raise funds. 1. Identify accessible playgrounds, and add them to the database. Do any have smooth, resilient surfaces that are accessible to wheelchairs, or are their surfaces sand or wood chips, which wheelchairs cannot navigate? 2. Characterize the local play opportunities for disabled children. There is space on each playground page to add comments, tips and even photos of key features. 3. Provide feedback. Go to the accessible playgrounds app, test it out, add to it and comment. As home design fundamentally changes to accommodate aging-in-place by applying Universal Design it becomes one of the primary market forces assuring the success of Inclusive Tourism - with the world in their reach travelers will simply not pay for lodging and tourist destinations that are a step down from the safety and convenience of home. The challenge for hotel, resort, and transportation designers is how to incorporate Inclusive Design and not merely add accessibility features that look and feel institutional. El tres por ciento del total de habitantes en el Municipio de Puebla padece algún tipo de discapacidad, por ello el Sistema Municipal DIF puso en marcha el Taller de Dise?o Universal, con el objetivo de fomentar una cultura de respeto hacia este sector de la población, así como facilitar la accesibilidad arquitectónica, administrativa y de comunicación de las personas con discapacidad. El Director General de este organismo, Joaquín García Vinay, informó que de acuerdo a datos del Censo de Población y Vivienda INEGI 2010, en la ciudad de Puebla habitan 1 millón 539 mil 819 personas, de las cuales el tres por ciento tiene algún tipo de discapacidad, es decir 46 mil 977 personas. "La encomienda que tenemos las diferentes áreas del Gobierno Municipal de Puebla es la de innovar tanto en materia de capacitación como en los proyectos, para contar con los mecanismos que nos permitan construir infraestructura adecuada para todos los sectores, en especial para uno tan importante como son las personas con discapacidad", puntualizó. A travel start-up which is aiming to create a new global standard for accessible hotel accommodation has gone live and is looking for hotels to sign up. AccessAllRooms.com is the concept of wheelchair user James Price who was paralysed in a diving accident in 1999 when he was 21 years old. A television presenter for the BBC Holiday Show and director for GB Wheelchair Rugby, Price is more active than many able-bodied people and is a passionate traveller. This year's Soldiers to Summits (S2S) expedition will take a team of 12 service men and women (including one veteran using SideStix), alongside world-renowned mountaineers including Erik Weihenmayer, into the breathtaking landscape of the Peruvian Andes Mountains. Using mountains as both a metaphor and training ground, S2S helps veterans overcome adversities and reclaim their lives. Regardless of physical, mental or emotional challenges, Soldiers to Summits teaches participants to embrace a "No Barriers Mindset". Through transformative journeys, participants walk away with skills that not only serve them in the mountains but benefit them throughout the rest of their lives: to set ambitious goals, to build world-class teams, to find creative ways to overcome obstacles and to serve others in need. The new website for Anjlee Agarwal's organization, Samarthyam, has been posted. The URL is www.smamarthyam.com. 7th International WILD Program Begins! Twenty-one disabled women activists from Africa, Asia and the Pacific, Latin America and the Middle East have arrived to the U.S. for our 7th international Women's Institute on Leadership and Disability (WILD) Exchange Program being held this month in Eugene, Oregon. Embracing the "Loud, Proud, and Passionate ?" theme, WILD women are participating in intensive seminars, workshops and site visits, team building activities such as an outdoor challenge course and river rafting, and staying with local families. These activists, representing diverse disabilities, bring expertise in fields such as law, policy, business, human rights, youth empowerment, education, health, media, HIV/AIDS, and violence prevention. During WILD we also host the Gender, Disability and Development Institute (GDDI) where delegates meet with representatives from international development agencies later this month. This innovative retreat goes beyond rhetoric and workshops to engage participants in direct dialogue about strategies for including women and girls with disabilities in development projects throughout the world. For live updates about the program, follow us on our social media and blog. The WILD program is made possible by the generous support of the American people through the United States Agency for International Development (USAID), with technical support provided by the USAID-funded Leadership, Management, and Governance project. WILD is also supported by generous sponsorship of local businesses and families in Eugene and Springfield. Attracting more tourists, and maintaining viable tourism flows in the low-season. For information about the Call and application forms, please visit the European Commission website. The next webinar in the Board's free monthly series will take place September 4from 2:30 - 4:00 (ET) and will feature an open question and answer session with Board accessibility specialists. Questions are welcome on the Board's accessibility requirements and rulemaking activities, including the ADA and ABA Accessibility Standards, the Section 508 Standards, new standards being developed for medical diagnostic equipment, public rights-of-way accessibility, and other topics related to the Board's work. 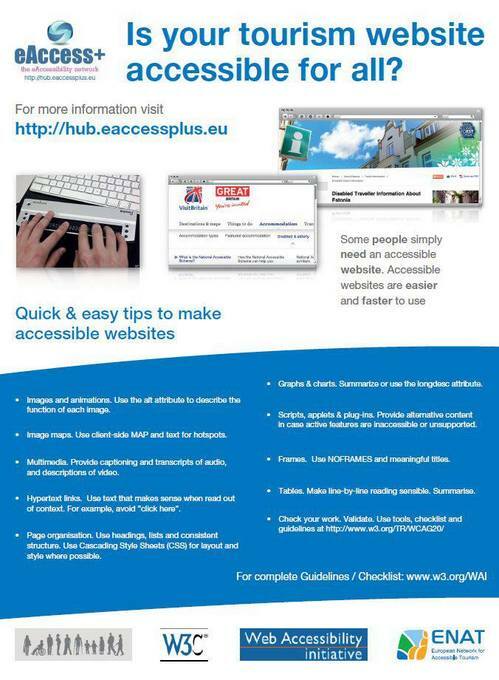 For more information, including registration instructions, visit www.accessibilityonline.org. The Access Board's Rail Vehicles Access Advisory Committee will hold its first meeting Oct. 15 and 16 in Washington, D.C. It will recommend updates to guidelines covering transportation vehicles for intercity, rapid, light, commuter and high speed rail. Meetings are open to the public with designated public comment periods held each day. To learn more, visit the Board'swebsite, email Paul Beattyor call him at 202.272.0012(v) or 202.272.0072 (TTY). disability NGOs based in Botswana. Any type of disability would be helpful.